'American Werewolf in London' fans got a sneak peek from director John Landis over the weekend at a Blu-ray version of the cult horror flick that's set to feature all-new bonus features. According to a report from Bloody Disgusting, Landis attended the HorrorHound Convention this past weekend in Pittsburgh, and gave fans a sneak peek at a first-ever Blu-ray version of his pioneering horror-comedy that the director says is currently in the planning stages by Universal. Originally released by the studio on HD DVD back in the Fall of 2006, extras on that version included audio commentary and brief making-of materials, all of which mirrored the 2001 DVD special edition. But according to Landis, Blu-ray fans will get even more, including a brand-new 90-minute documentary called "Beware the Moon: The Making of 'An American Werewolf in London,' that features retrospective interviews with cast and crew. Landis said there is no street date yet, but Universal is currently preparing the Blu-ray release for "sometime next year." 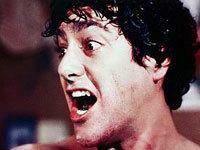 At press time Universal had neither confirmed nor denied plans for an 'American Werewolf' release on Blu-ray, but as always we'll keep you updated as any official news comes in. In the meantime, we've added 'An American Werewolf in London' to the "Release Dates Pending" section of our Blu-ray Release Schedule.